The scope of this document is to describe the SST secure service design to align it with the uniform secure service signatures. Currently, a <service_name>_veneers.c file is created in the secure_fw/ns_callable directory, that specifies the signature for each veneer function, and calls the secure function from the veneers. The respective interface/include/<service_name>_veneers.h file with the veneer declarations is created and maintained manually. In addition, the TF-M framework, aligned with that design, limits the range of valid return values a secure service can provide, reserving a range for framework error codes. TF-M Core can do a sanity check on the access rights of the veneer parameters, and there is no need for the secure services to make these checks individually. Please note that in the present implementation sanity check is only fully supported for level 1 isolation. A detailed information about the signature can be found in [ 1 ]. 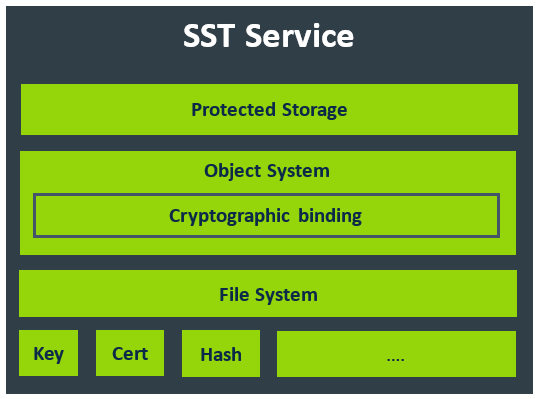 The current SST service implements a set of components, each one dedicated to implementing a specific functionality in each layer of the SST service firmware stack [ 2 ][ 3 ]. Protected Storage layer: This layer exposes the PSA protected storage set of interfaces which are compliant with the PPS APIs specification. Object System: This component contains the object system implementation to manage all objects stored in the SST area. File System: It abstracts the flash filesystem operations for the secure storage service. The purpose of this abstraction is to have the ability to plug-in other filesystems or filesystem proxies (supplicant). Currently, it implements a custom filesystem based on a non-hierarchical storage model where all the files are managed by linearly indexed list of metadata. The new design adds the SST request manager layer as the entry point to the service. This layer manages all requests which arrive to the service, and performs the proper Protected Storage calls. Detailed information about this layer can be found in the section below. The SST request manager handles all requests which arrive to the service. The interfaces of this layer are aligned with the unified secure service signatures. This layer extracts the arguments from the input and output vectors, and it calls the protected storage layer with the provided parameters. It also checks that the number of parameters and sizes are aligned with the protected storage interface to call. This function handles the PSA PS set requests. in struct psa_invec * in_vec Pointer to the input vector which contains the input parameters. in size_t in_len Number of input parameters in the input vector. out struct psa_invec * out_vec Pointer to the output vector which contains the output parameters. in size_t out_len Number of output parameters in the output vector. A status indicating the success/failure of the operation as specified in psa_status_t. PSA_SUCCESS The operation completed successfully. PSA_CONNECTION_REFUSED The operation is refused because the number of input or output parameters in the vectors are incorrect or their types are incorrect. The following table shows the input parameters mapping in the in_vec vector. The following table shows the input parameters mapping in the out_vec vector. This function handles the PSA PS get requests. This function handles the PSA PS get info requests. This function handles the PSA PS remove requests. This function handles the PSA PS get support requests. 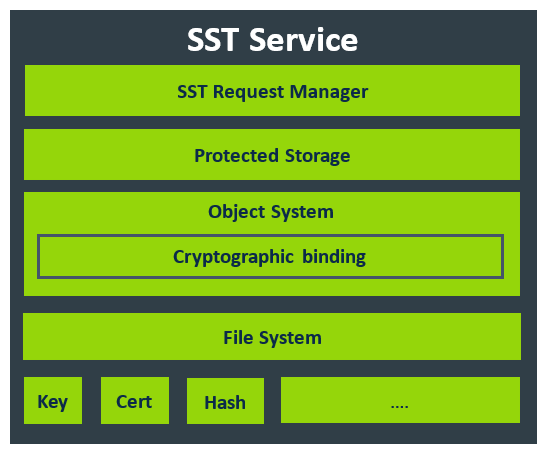 The SST manifest file must be updated to expose the SST request manager functions rather than the Protected Storage layer. However, the “tfm_init_symbol” entry needs to be tfm_sst_init as this is the function which initializes the service. The “source_file” list must be updated to add the new SST request manager files. The legacy TF-M framework, used by the current SST implementation, limits the range of valid return values that a secure service can provide, reserving a range for framework error codes. For that reason, the TF-M SST codes need to be different from the PSA PS ones. The uniform secure service feature in TF-M framework does not have this requirement anymore, so the current TF-M SST error codes must be replaced by the PSA PS ones [ 4 ]. The current implementation must be updated to evaluate psa_status_t return codes from TF-M framework. In case, TF-M framework returns a value different from PSA_SUCCESS, the interface should return a PSA_PS_ERROR_OPERATION_FAILED as a PSA PS error code. Otherwise, it should return the error code returned via out_vec. Each PSA PS API implementation must map the input, output and return vales as defined in section "SST request Manager" per each request interface. PSA Arch tests [ 5 ]. However, the psa_ps_ns_interface and psa_ps_s_interface test suites must be updated to modify the tests which check the validity of the callers memory referenced by a pointer. All the null pointer checks must be with data length equal to 0. The new TF-M framework incorporates a mechanism to check the validity of the memory area referred by the pointers plus data length [ 1 ]. If secure partition requests a service with an invalid pointer with a data length different from 0, in one or more parameters, the TF-M frameworks returns a specific error code to reject the request. In the other hand, if a non-secure application requests a service with a null pointer with a data length different from 0, in one or more parameters, the TF-M framework blocks the request and it does not return the control to the non-secure application.